Lynx Professional Kitchen Equipment Company (“Lynx”) is a leading manufacturer of premium branded outdoor gas grills, beverage carts, and related grilling, barbequing and outdoor cooking parts and accessories. MelCap Partners acted as the financial advisor to the buyer, Autus Capital, LLC. 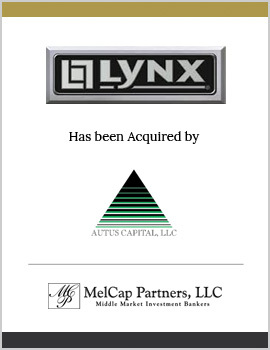 Lynx was acquired by a newly formed entity, Lynx Grills, Inc., that is owned and controlled by Autus Capital, LLC.